TURNBULL and Obama Government officials are racing to begin resettling refugees in the United States before the incoming Trump administration can halt the deal between the two countries. Prime Minister Malcolm Turnbull has ordered the biggest peacetime border protection operation in Australian history to deter people smugglers after the US agreed to accept refugees currently held on Nauru and Manus Island. The agreement will see women, children, family groups and other vulnerable refugees assessed for residency in the United States. US Homeland Security officials are expected to arrive in Australia within days to begin arranging health and security checks. Mr Turnbull yesterday publicly thanked President Barack Obama for agreeing to the one-off deal, but was unable to say if incoming president Donald Trump would honor the agreement after he was sworn in on January 20. Mr Trump has previously called for a temporary ban on Muslim immigration to the US and many of the 1,145 asylum seekers on Nauru and 958 on Manus are Muslims. 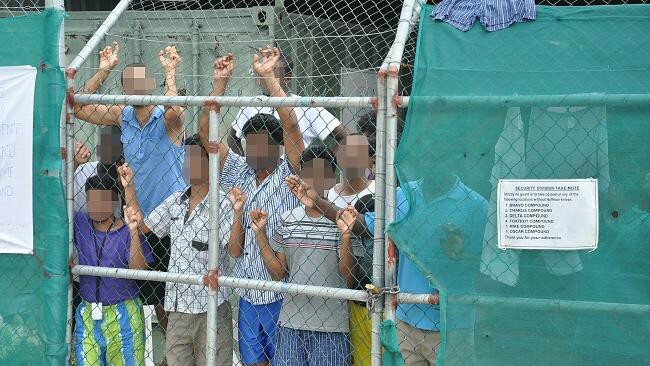 Asylum-seekers behind a fence at the Manus Island detention centre, Papua New Guinea, in 2014. Picture: AAP/Eoin Blackwell “We deal with one Administration at a time,’’ Mr Turnbull said. The “one-off” deal will only apply to people already on Nauru or Manus who have been processed by the United Nations High Commission for Refugees and deemed to be genuine refugees. Australian authorities are concerned the announcement could be used as a “marketing opportunity” by people smugglers. The Australian Defence Force and Border Force have been preparing for the announcement for several months and additional ships and AP-3C Orion surveillance aircraft have been deployed to detect people smuggler boats. “Any people smuggling boats that attempt to reach Australia will be intercepted and turned back,’’ Mr Turnbull said. The Federal Government plans to close the Manus Island processing facility but will keep the Nauru centre open indefinitely. It will continue to encourage asylum seekers deemed not to be refugees to return to their home countries. Opposition Leader Bill Shorten yesterday offered qualified support for the agreement. “It has taken the current government three plus years to negotiate this one-off deal but we are pleased if it means an end to indefinite detention, especially for genuine refugees and they get the opportunity to be regionally resettled,’’ Mr Shorten said. The Federal Government is continuing to negotiate with other countries which could potentially take some of the asylum seekers denied entry to Australia. In September, Australia agreed to support a US-led Central American refugee resettlement plan by accepting Hondurans and El Salvadoran refugees from a camp in Costa Rica.